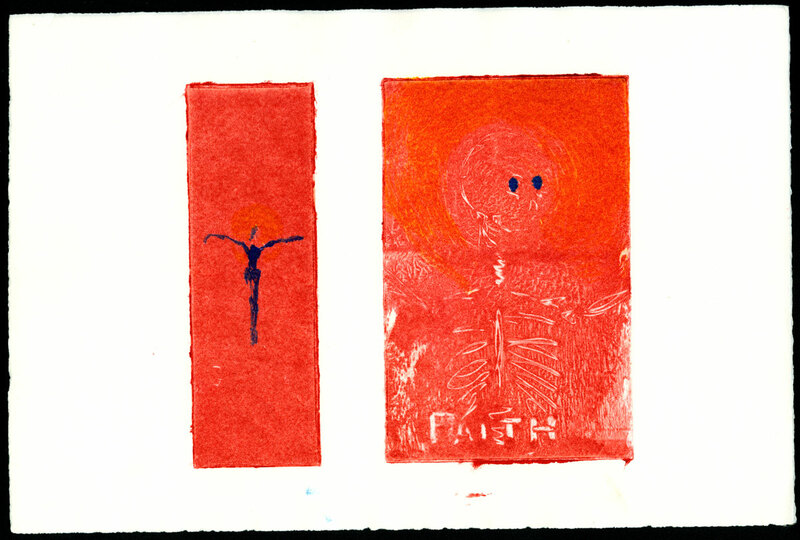 This is the match to Faith I, this time with extra details done in rich primary colours. The blue cruciform figure floats in its own smaller field, while the close-up reveals the morbidity of the everyday image of faith. In addition to the rich blue there’s a subtle gold halo around the figure, done with color this time instead of scratching away. There’s a lot to think about from this starting point, and a lot to be said, but it’s all difficult to approach without offending someone. Art can often open a dialogue where words fail, though there’s still a conversation to follow up, whether in words or images. Faith II, 12″x8″ monoprint on watercolor paper, $199 with free shipping.